corrected a little mistake, i had forgotten to remove the internal gun. Sorry my fault. In mid 70th the egyptian technicians replaced the R-11 engine of the MiG-21F13 by the R-13 which came with the MiG-21MF. When it became obviesly that it was a successfull project the same upgrade program was started with the MiG-21PF. The R-11 was replaced by the R-13 engine and in the most cases the holding bolt for the GP-9 gunpod was included. In some few cases the brakechute container was placed above the engine pipe as it is known from the later MiG-21 seria. 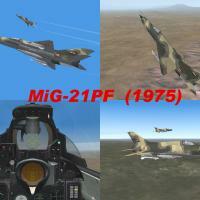 With this upgrade program the MiG-21PF became faster and more agile. With the gunpod the MiG-21PF pilot had a substancial increased dogfight capability. and only the small ini edit is made by me. -1. Unzip all files into your objects/aircraft folder. -2. Unzip file gp-9 gunpod.zip into your weapons folder and follow the instructions you find in the readme with the name"add to weapondata.ini"
The MiG-21PF_75 is FREEWARE. COMMERCIAL USE IS NOT ALLOWED!